Are you thinking of training with us in Applied Biomagnetic Therapy? Today, we would like to share with you feedback on our recently held Practitioner’s Certification in Applied Biomagnetic Therapy – Foundation Workshop which took place in the Ballsbridge Hotel, Dublin, Ireland from the 19th to 23rd November 2018. The data contained in this Evaluation Report is to display the results of a questionnaire survey administered to participants at the end of the programme. Its purpose was to evaluate the effectiveness of the programme in this unique Applied Biomagnetic Therapy. 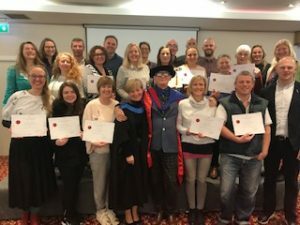 For clarity, there are two elements to each Practitioner’s Certification in Applied Biomagnetic Therapy namely (i) the Foundation Programme and (ii) the actual Certification Programme, the next one being scheduled for March 2019 in Dublin, Ireland. 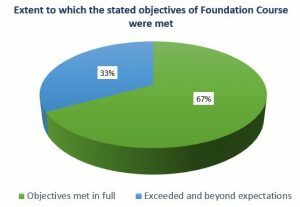 This Evaluation Report is focused on the Foundation Programme. From the responses, the chart below shows that 100% of the participants evaluated that the objectives of the training were either fully met or exceeded their expectations. Our next Foundation Programme is scheduled for 13th to 17th May 2019. On completion of this 5 day course you receive a Graduation Certificate and attend a graduation ceremony. The image below shows all of the students from the November 2018 graduation class.